It is with sadness that we are sharing this news with you. Our Honorary 1953 Patron, former Trustee and good friend, Susan Band, passed away on 20 April 2018 after a period of ill health. 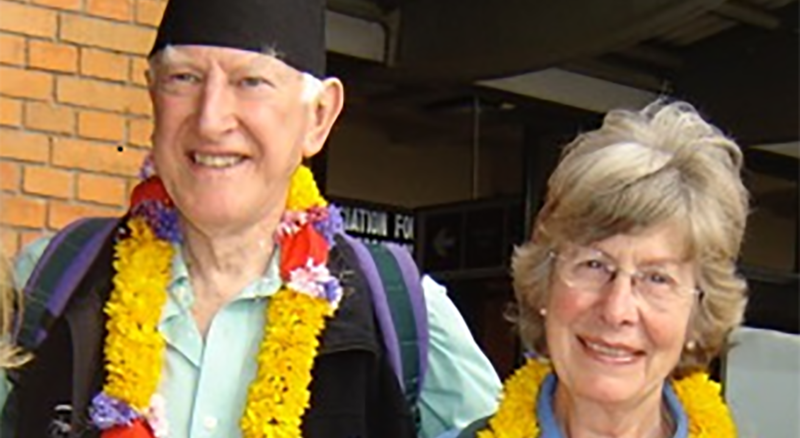 Susan and her late husband, George Band, a former chairman of the HTUK, worked for many years to support our projects in the Everest valley and in the Taplejung district below the Kanchenjunga range. Susan was particularly keen on helping to improve the education and health provision in the more remote villages, far from the main trails. George and Susan were held in great respect and affection by the local people. In 2013, following the death of her husband in 2011, Susan led a group of Trustees, members of her family and friends on a trek to visit some of the villages, schools and clinics in Taplejung district. There has always been a close bond of friendship between the families of the 1953 Everest expedition, of which George Band was a member. Susan Band was a lovely lady supported by a strong family. The HTUK extends sincere condolences to the Band family at this time.